As regular readers will know I am not really one to jump to reviewing runway collections the moment they are showcased. I prefer to give myself some time to really consider each collection, although there are always inevitably those gut reactions one deals with. However I thought it might be nice to provide a brief series of initial reactions. Burberry's attempt at a Perfecto jacket? I tend to dislike leather motorcycle jackets which have that new sheen to them, the leather usually looks stiff and awkward. 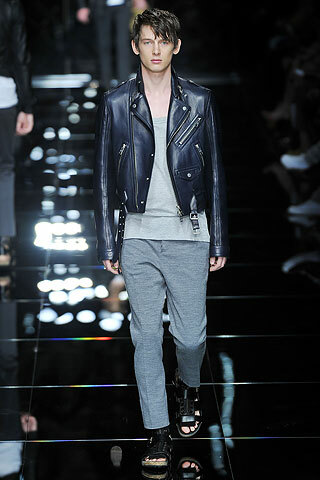 Yet the weighting of the leather on this jacket looks soft and light. I like the rather traditional play between the extended cuffs and slightly cropped waist, although the overall cut of the jacket is thoroughly modern. The pairing with the soft jersey scoop neck and jersey trousers was interesting and provided a nice juxtaposition of elements. Motorcycle jackets to me tend to evoke a sense of harshness and strength, usually being slightly battered and worn with faded jeans and dusty boots. Comparatively jersey trousers remind me either of casual sportswear or lounge wear. There is that play between soft and hard, which was made all the more interesting by the apparent softness of the jacket itself. It had a clean finish which worked nicely against the plain clean cut jerseys. 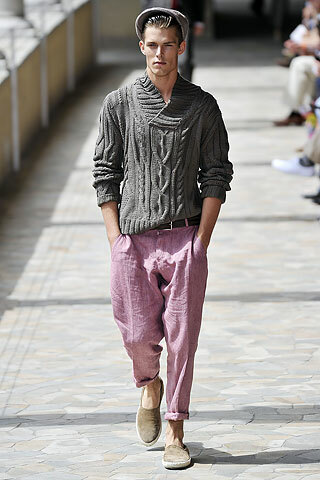 There have been a rather large number of loose Spring knits on offer thus far and Burberry sported their fair share. Vintage clothing stores actually stock quite the selection of loose knitted vests, polo shirts and sweaters this time of year for clearance prices, and the parallel was rather amusing to behold. 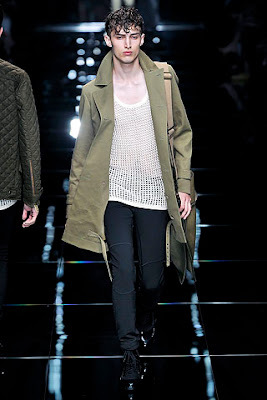 I really did like the look of the loose knit vest worn under the khaki jacket, especially when paired with the satchel. 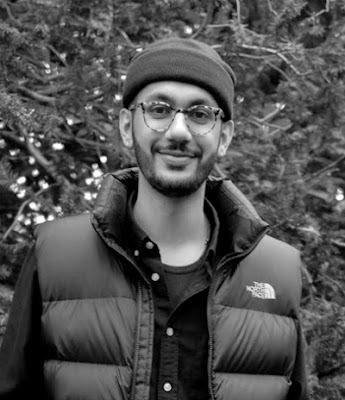 It had a militaristic quality, of webbing and khakis, that was somewhat romantic in a way. Of course Burberry's tailoring is always impeccable, and I did find the jacket very appealing. The trousers were again an interesting choice, with a softness that perhaps belied the rest of the look upon first glance. Yet the mirroring of the vulnerability of the loose knit upon bare torso and the soft draped trousers with reinforced knees was rather nice. What would fashion week in Italy be without exemplary tailoring? I loved the cut of this jacket, with the gently sloped shoulders, tighter rolled sleeve head, lower cut arm hole, relatively slim revers, and a rather bold front line that was not cut away from the body. The flap pockets on the jacket were a good choice as they emphasized the more hourglass silhouette, adding a bulk underneath the nipped waist that paralleled that of the shoulders. I particularly enjoyed the white buttons and folded white pocketsquare. I like the fact that only a sliver of shirt cuff was displayed, and that the shirt had a very soft collar that provided a flatter profile. 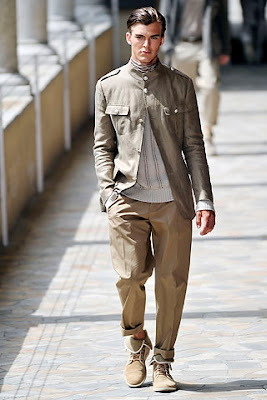 The look would have been a wonderful suited look with matching trousers, however the styling with the tan trousers merely highlighted the mix-and-match quality of the garments offered within the collection. Personally the matching was slightly uneasy (perhaps a touch of pale blue was needed to break it up? ), however it certainly looked good. Again I found the cut of this jacket quite wonderful. I enjoyed the slightly longer sleeves and the silhouette with the tight shoulders and nipped waist. 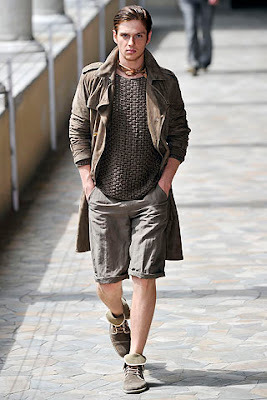 The styling of this look was rather interesting, and seemed perfect for a Summer weekend. Everything from the hat to the exquisite white-laced blue brogues had a casual elegance that was charming. I think the trousers worked far better in this look. The slightly low rise, longer seat and straight leg gave a casual yet smart feel to the look, indeed I feel that a cuff or rolled hem would have detracted from the finish. Safari jackets seem to be making the comeback, and whilst I have yet to be sold on the idea (actually a few examples from certain collections left me slightly perplexed), this was one of the toned down few that I actually enjoyed. The styling with the buttoned neck allowing the jacket to fall away provided a really nice line. The epaulettes and patch breast pockets added an extra impact to the upper half of the jacket allowing for a stronger, more masculine finish. 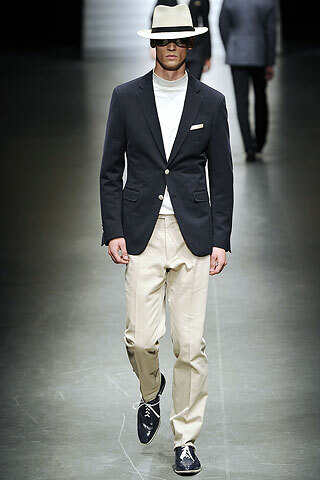 Yet that strength was played against by the silk neckerchief, soft knitwear and the overall finish to the look itself. The loose, cuffed trousers provided a very casual feel to the look, and indeed there was a casual softness throughout that I really did enjoy. I absolutely adored this look. From the chunky knitwear, to the silk neckerchief, to the lightweight trench, to the soft linen shorts, to the folded over suede boots, it was beautiful. The overall softness really did make it appealing, with the crushed linen and pushed up sleeves giving it a laid back and comfortable feel. Again I loved this look. The combination of the loose linen rose-coloured trousers with the rolled hem and the soft suede slip on shoes was delightful. The shoes actually reminded me of the slip ons that Hiroshi Tsubouchi has designed for Monocle (click here) that I would love to buy...were the price ever so slightly more affordable. i really liked burberry's offering too. haven't checked out loads of the shows yet, first stop was jil sander. really liked the mesh used in burbs show. Did you see the McQueen collection? Although I don't think I'll fully form my opinion until I see the women's collection, I'm impressed with what Sarah Burton's done so far in the chaos of the past few months. There were a few pieces that made me think of you - especially this burgundy double breasted jacket with black piping on the pockets. Loving the pink & grey combo DK! As big of a jeans-on-boys fan I am, I have been falling hard for those perfect tailored looks. I blame Robert Downey Jr. and his three piece suits for this! 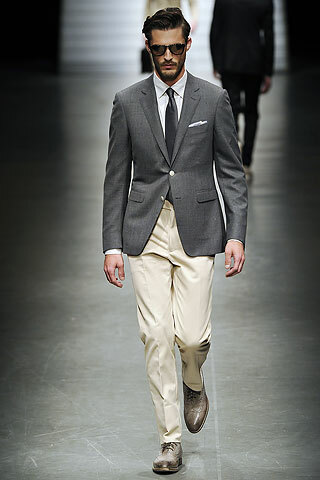 The pairing of the dark colored suit jackets with those cream pants is exquisite and so perfect for summer! Great analysis and picks! I am a huge fan of the contrasting soft-edgy pairings you've shown here and in general.